Fell on slippery surface, landed and broke wrist on falling. be the need for an operation. The mobility of this arm, wrist and hand was reduced to almost none on the damaged side. Her body held itself in a diagonal twist to compensate for the pain. There was a sling that was supposedly supporting her wrist, but had been so badly applied that it in fact was causing damage to her cervical neck area. She complained of extreme pain all through arm, wrist, hand and fingers. Shoulders and legs and in fact all over her body. Having tested her for antioxidant levels, immune response, nutrient base, acid base etc. I found her to be in reasonably good health apart from the obvious injury. tivity areas to work on at the upper thoracic levels and abdomen. Also, at one place at the lower spine. There had been a car accident some years ago in which a vertebra had been pushed out of alignment and this was exactly what was showing here. I began working at this vertebra in scenar-cosmodic slider auto and one dose here was enough in 36 seconds. I then spent the time working on the upper thoracic. I then worked in Scenar at this vertebra following this, I went into slider 5 at upper thoracic. Batteries flickered in the display after 6.06 so I stopped and changed them. Then I continued in slider 5 for a following 22.53 minutes. I worked in MYO for the remainder of the time to shoulder, arm, wrist and fingers. Total time spent was 33.18minutes. All swelling had greatly reduced. She felt very much taller. The dull pain that had overcome her entire body was now gone. Specifically pain in her arm and wrist was now also gone. Felt that she could sleep which for 3 days she had not been able to due to the pain. She found when she looked in the mirror, that her skin had lost the grey look and was pink again. She reported that she had slept well all night. and found that she was able rest and begin to recover. that she is having trouble stopping herself from using the hand. I am supporting her liver with a tincture of milk thistle drops in water 4 x times a day. She says her whole body is feeling even lighter than before. She managed to shower today covering her wrist in a plastic bag. She is still pain free and this morning had a small ache in the elbow area. She is feeling hungrier and her appetite is returning. I began this session in scenar-cosmodic-slider and took readings. The readings showed in very much higher figures than the previous slider. i.e. the average readings yesterday were around 12, low were at 3 and high were at 19. Today readings were average at 38, high at 99 and low at 24. Today’s high were at upper thoracic once again plus the same place at lower spine and mid way vertebra, as the day before. I dosed the vertebra in this same setting and this was to the left then centre then right side of spine. Next I went up to the top right shoulder area where indicated by the chart and whilst dosing this, the thumb of her good hand suddenly took her arm, on this same good side (the undamaged one) and lifted it into the air briefly. She laughed! I then went to the opposite side and dosed here. After about a minute the device restarted and began again .. I let it run and waited, expecting it to do the same again and it suddenly dosed! 1.45 minutes. I then turned into SC-Cos-slider MYO power level 60 and worked on both sides of shoulders across and down to the elbows and arms and then wrist on good side. On the damaged side I went onto fingers also. I then went into sc-cos-slider auto and worked on dosing across fingers and knuckles. Her energy levels felt even greater compared to after yesterday’s session. Her neck felt better afterwards, she realized that it had been aching without her noticing. She can straighten out her fingers now and put her hand flat on the table now. More refreshed and has returned mobility to hand and fingers. No pain in anywhere in body especially the dull pain in arm gone. She feels lighter all over. Overall the moment I placed the device on her, without my telling her anything! She asked me, had I changed something in what I was doing as it felt very different today! “It feels like in one respect much lighter and less but in another way it feels far more! In fact like a different machine?? This feels that I can feel a loop inside me that is connecting everything. Like it’s going all around. Then she said she felt so amazing that she knows she will not be having an operation now and I will see her again the day after tomorrow. Since the last session the bruising was now emerging. She had experienced what she described as a big emotional outburst that morning and was now feeling much better about herself. This moment she had some stiffness across both shoulders and her fingers felt a little tight once again. Slight swelling much less than before. I decided today to work mostly in scenar – slider as many readings were showing a higher ratio of scenar to that of cosmodic. Highest readings in general were across shoulders and also lower spine. Doses here were on average 2 – 3 minutes. I felt that in this setting today the doses seemed to happen more easily. After I had dosed all areas accordingly I changed my setting into sc-cos-slider MYO and worked across both shoulders in this and a little at upper thoracic area. She reported, once again a feeling of euphoria. Also she called it her face lift treatment as following each time that we worked she rushed to look into a face mirror and noticed both her cheeks felt like they had been lifted, although to be frank I am not sure if this was a feeling or an observation. The site of the injured hand appeared to have flattened and assumed a more normal shape now and her fingers were with less pain and her knuckles relaxed which had been tight before. She said she felt like a new person and much refreshed. Her whole body felt lighter and that she wanted to smile and not to cry! After last session all swelling had reduced and previously poor areas were normal. Full mobility was restored to most areas with exception of wrist rotation. She had returned to hospital and the cast had been removed. However after some arguing between doctors they replaced a new cast as they would not believe that her bones could have healed so quickly, therefore just in case there was some mistake they wrapped a new cast which was very much too restrictive and the following morning, having not slept due to such pain and the return of swelling this was removed and replaced with a slightly better fitting cast. 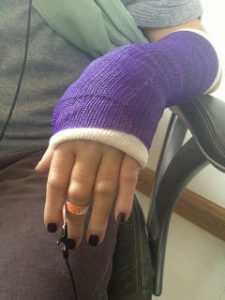 Presiding symptoms today were pain and swelling due to damage caused by ill-fitting cast. Tiredness due to lack of sleep. This session I chose to work in a variety of modes. Beginning with readings and preliminary work in SC-Cos Slid – Auto. Then Scenar Slider Auto followed by Scenar MYO. Highlighted areas were as expected with addition of one at liver – spleen level. Total time worked was 41 minutes. She felt like her head was rising up again and her spine taller. The sensation today had felt tingly and sporadically stronger. I had attempted to use a tablet probe but it would only work alone and not together and with the internal electrodes. The work I did had made her hands feel like they wanted to stretch out and she also had a sharp sensation in the rear of one leg muscle momentarily which apparently she gets when she runs too hard normally. All swelling reduced once more and the whole arm once again felt normal. She was able to lift the previously damaged hand on its own and move her fingers easily. There had been some time passed, as she had needed to return to some working life. There was since the last session a slight amount of swelling and a small amount of pain also. She had used some mild pain relief but not much. Her knuckles felt a little tight. I began working in maximum and then had to reduce to minimum as it became a little intense. I had begun in a maximum setting as I was missing the Slider 2 so much and being able to choose such specific settings that at first I just didn’t feel I had enough choice to my tools. However very quickly I found that I did!! High readings were indicated as expected to top of thoracic, upper and lower locomotor points and also I noted that the mid spine higher readings of before had now become balanced. I worked in SC-Cos slider 10. Scenar MYO to the end. The sessions were each approximately 38 – 40 minutes with exception of the 7th one which was 50 minutes. On the 6th session the final cast was removed and we saw her wrist looking delicate and as she said herself, pre historic dinosaur-like! We worked the entire wrist, muscles, fingers after having worked at the spine and at the finish I massaged specially mixed oils and crème into the skin after having exfoliated it first. Her finger tips had begin to feel cold and tingly and now they were becoming warm again and the tingle sensation had gone. She became quite emotional when I worked along fingers and at tips, her eyes filled with tears. Her shoulders ceased to ache. Her posture improved more permanently. Felt safe to drive once again. More mobility and rotation of arm and wrist. The constant dull pain was now gone. Could flex the arm upwards, unlike before. Each time we worked she still felt the euphoria as from the start. Also the face-lift sensation! I could now see exactly what she referred to now, she was beginning to look much younger and her skin more fresh. We had a little way further to go as now it was clear that the shape of her wrist bone still required some work and also the rotation of her arm from the elbow was a still not 100 %. This day, once again the high recorded priorities for work were at neck and shoulders also similar importance given to the coccyx area and lower spine. Having worked in Cosmodic today and then Cosmodic with Slider 1 device, I completed the session with firstly massage in MYO and then dosed all fingers and knuckles with the use of 02Ag tablet probe. Altogether the work on body this day was 26.37 and local to fingers 5.41. She reported that her movement of the wrist was greater. There was now a tingling sensation in another finger which had not been before. 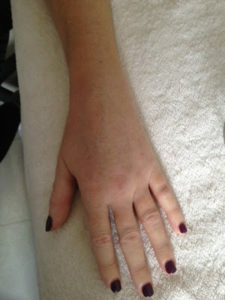 All swelling had disappeared and the look of the hand, wrist and fingers was more normal. She continued to do daily exercises (specific ones that I and her physiotherapist had shown her) some massage with essential oils and creme. Her entire arm, wrist and hand are now looking much better. She is doing all the exercises that a colleague and I gave her, plus some hand exercises I showed her. 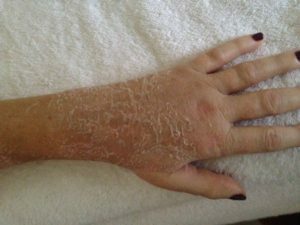 The outer side of her hand was stiff a little now and after having had a large workload since last session a collection of lymph had appeared in her arm, which had reduced this morning but was slightly still there. Rotation of the arm had increased slightly. Priority readings showing at locomotor place upper and lower. Also across liver and spleen level. Overall the session was 41.43 minutes. The moment I touched her with the device she felt her wrist went warm. The moment I placed the device over the spleen area at the spine, she began to giggle as her thumb turned her hand over once again (this time the damaged one) and her two fingers raised themselves into the air without her control. This occurred after 2 minutes and 3 minutes. After 21 minutes I then went into scenar-slider- auto and worked locally to wrist. I could see that the bone in her wrist was now a normal shape once again. All swelling in her wrist had now gone. She was able to turn her wrist and arm from the elbow over more easily. 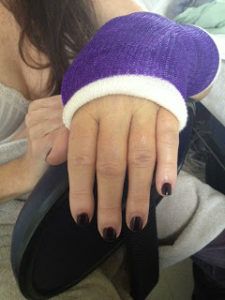 Her fingers looked slightly lumpy so a slight amount of swelling here still. She was able to lift items now with the previously damaged hand. Best of all is that she burst out in a loud voice that she felt normal again!! For work she was going to use an elastic bandage for support but otherwise now her arm was without any splint most times. She had then to rush off to work as her job called and will not be able to return for a couple of weeks so the update will come soon. Finally at the last session that she was able to attend she was so very pleased as she was really able to grip once again and said that her arm really felt normal once again. I HAD A BAD FALL ON 21ST DEC 2012 . I THEN HAD TO GO TO ANOTHER HOSPITAL A GOOD HALF AN HOUR AWAY FROM MY HOME BY CAR . THE PAIN IN THE MOVEMENT IN THE CAR WAS HORRENDOUS ! I WAS THEN GIVEN MORE X-RAYS AND RELIEVED TO FIND OUT THAT THE BONES HAD BEEN MANIPULATED BACK IN TO PLACE WELL, SO NO OPERATION WAS NEEDED JUST A CAST FOR POSSIBLY 6 0R 8 WEEKS. SEVERAL DAYS LATER A FRIEND OF MINE INTRODUCED ME TO VIVIENNE CONSTAD AND THE AMAZING SCENAR METHOD . I WAS RELIEVED TO SEE THAT THE PROCEDURE CONSISTED ONLY OF WORK ON MY SPINE AND MY GOOD HAND. AFTER ONE AMAZING FIRST SESSION I FELT PAIN FREE AND MY FINGERS ON MY BROKEN HAND STARTED TO MOVE. ALSO AMAZINGLY COLOUR CAME BACK INTO MY FACE AND THE WHITES IN MY EYES LOOKED HEALTHY AGAIN. I GUESS BECAUSE I WAS PAIN FREE. FIRST NIGHT AFTER SESSION I SLEPT SO WELL , NEXT DAY WOKE TO NO PAIN. JUST MY ANNOYING BIG CAST ON MY ARM. WAS EVEN BETTER AND AGAIN RELIEVED THE PAIN. I ALSO FELT VERY EUPHORIC AFTERWARDS LIKE I COULD SKIP DOWN THE STREET. YEP NEW YEARS EVE WHILE THE REST OF THE WORLD SEEMED TO BE GOING OUT AND HAVING FUN, ALL I WAS BOTHERED ABOUT WAS FEELING BETTER AND GETTING OVER TO VIVIENNE CONSTAD! AFTER MY SESSION I WAS AGAIN IN NO PAIN AND FELT LKE I COULD HAVE JOINED IN AND DANCED THE NIGHT AWAY, BUT WAS GOOD AND RESTED. EACH SESSION GOT BETTER AND IT FELT LIKE MY HAND INSIDE THE CAST WAS HEALING . EACH SESSION I HAD, THERE WAS A WAVE THAT SEEMED TO COME OVER THE BROKEN HAND AND TAKE AWAY THE PAIN. AFTER THE 31ST I HAD 2 MORE SESSIONS NEAR TO EACH OTHER. THEN AFTER THAT AS I HAD TO TRY AND DO SOME WORK I COULD NOT GET TO VIVIENNE FOR OVER A WEEK AND BOY DID I NEED THE SESSIONS. I HAD A FEW PAINS AND SWELLING CAME BACK A BIT IN MY FINGERS . . AFTER THAT I HAD 2 SESSIONS, UNTIL I GOT MY CAST OFF WHICH AGAIN KEPT ME PAIN FREE AND NO SWELLING. I WAS NOW FEELING BACK TO MY NORMAL SELF AND A FEELING OF POSITIVITY CAME BACK AGAIN . . THE DAY I WENT TO THE HOSPITAL WAS TO SEE HOW IT WAS COMING ALONG AND TO SEE IF I NEEDED FEW MORE WEEKS IN THE CAST OR IF IT HAD HEALED ENOUGH TO BE TAKEN OFF. LUCKILY FOR ME THE DOCTORS WERE VERY VERY PLEASED AND ALSO ASTOUNDED AS TO HOW WELL THE BONE HAD HEALED . TO WHICH I THEN EXPLAINED THE SCENAR TREATMENT I HAD BEEN HAVING . AFTER THAT TO MY RELIEF I WAS TOLD I COULD HAVE THE CAST OFF. AND THEN WAS CHECKED AGAIN AND THE DOCTOR WAS PLEASED. 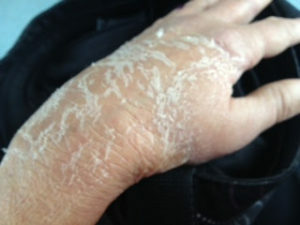 IMMEDIATELY THAT I GOT MY CAST OFF, EARLY THAT MORNING I RUSHED STRAIGHT OVER TO VIVIENNE CONSTAD AS WAS TAD NERVOUS AS MY HAND WAS SWOLLEN AND RED AND VERY VERY STIFF AND BASICALLY HAD HARDLY ANY MOVEMENT AT ALL. AFTER AND HOUR OF THE SCENAR MAGIC I FELT MUCH BETTER AND HAD SOME SWELLING TAKEN DOWN AND SOME MOVEMENT. SINCE THAT DAY I HAVE BEEN DOING PYHSIO AND HAVE HAD 3 MORE SESSIONS AND ALOT MORE MOVEMENT. THE SWELLING HAS GONE DOWN VASTLY. NOW I AM PICKING UP SMALL THINGS AND TYPING AND USING MY LEFT HAND ONCE AGAIN. ALL THE TIME I HAVE BEEN HAVING THE TREATMENT I HAVE ONLY EVER HAD TO TAKE A LIGHT PAIN KILLER A FEW TIMES AND THESE TIMES WERE THE TIMES WHEN I COULD NOT GET IN FOR TREATMENTS. WITH OUT A DOUBT IN MY MIND THIS TREATMENT HAS SPEEDED UP MY RECOVERY BY WEEKS . AND ALSO THE AMAZING FEELING DURING AND AFTER THE SESSIONS IS SO UPLIFTING . I WOULD TRULY RECOMMEND THIS PROCEDURE TIME AND TIME AGAIN . AS NO ONE WANTS TO BE IN PAIN AND WITHOUT THE USE OF A LIMB .